The 10 Best Places for Mac and Cheese in Washington! One of the best comfort foods around is macaroni and cheese. This ooey gooey cheesiness can turn a gray day into a day full of sunshine. 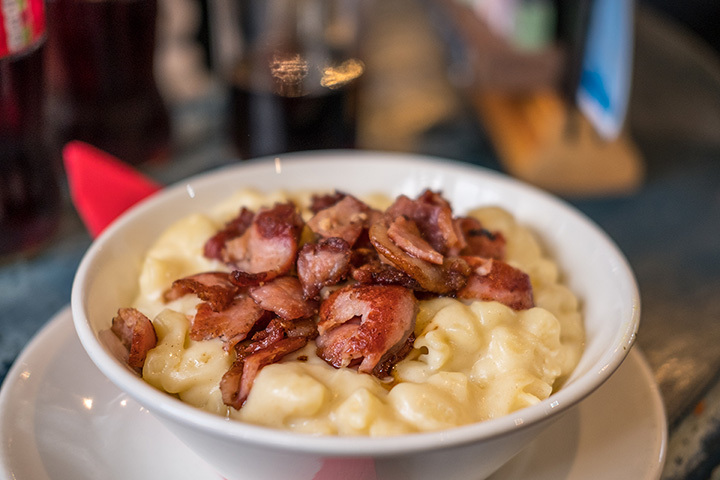 From traditional mac and cheese dishes to cheesy deliciousness topped with bacon, you’ll find all varieties of this classic dish at the 10 best mac and cheese places in Washington State. Dig in! Cheese, cheese, and more cheese. That’s what’s being served up at Tacoma, Washington’s Top of Tacoma Bar. From the golden cheesy bread appetizer served on a French roll and spicy dipping sauce to the nachos topped with Cheddar and jack cheeses, to the incomparable gourmet grilled cheese sandwich on sourdough and creamy pesto, you won’t find better cheese dishes than here. But the best of all is the amazing macaroni and cheese. This isn’t your typical mac and cheese. This golden creaminess is topped with a parmesan and panko crust, and you can add pork belly lardons, prosciutto, pesto, or grape tomatoes for a small additional charge. Founded on tradition, but not afraid of trying new things, Crave Grill in Vancouver, Washington, treats hungry diners with fun new menu items on a regular basis. But how can you improve on a favorite popular dish like macaroni and cheese? Crave does it by using fresh-made pasta, a special vodka cream sauce, crispy onions, and then adding bacon, barbecue, or spicy pulled pork, or chicken for a new flavor high. Try it out any day of the week. One of the area’s favorite bars, South Fork Public House in Pullman, Washington, does bar food better than anyone. Opened in 2010, they serve comfort food in a new way. Take their mac & cheese, for example. This isn’t your usual entrée, but a signature dish that uses penne noodles in a Cougar Gold cheese sauce, topped with bacon and scallions. To add to the comfort level, it comes with warm bread and a side salad Monday through Sunday from 11:30 a.m. until they decide to close. When they say they take a difference approach to pizza and pasta, they’re not kidding at Jackson’s Pizza. Located in Enumclaw, Washington, Jackson’s loves creating indulgent and decadent specialties like their famous Jackson’s mac & cheese. This well-thought out dish combines not one, but four cheeses with cream, adds pasta shells, and tops it with crispy bread crumbs. Choosing to add bacon, Italian sausage, or crab meat only intensifies the delicious experience! Right in the middle of Seattle’s North Capitol Hill area is the Wandering Goose. Offering Southern-inspired eats like biscuits, hushpuppies, grits, country ham, and sawmill gravy, we’re talking serious comfort food every day of the week. One of those comfort foods served at the Wandering Goose is macaroni and cheese, but not just any macaroni and cheese. This very special pimento mac & cheese dish is very similar to the delicious pimento spread that was a staple in the South and contains extra sharp cheddar cheese and lots of pimento peppers for a lick-your-plate-clean experience. Adding this as a side to a plate of buttermilk fried chicken is like being in food nirvana. A little eatery tucked away in Washington’s capital, King Soloman’s Reef serves big flavor with all their dishes. Using produce and other food products from local food vendors, the restaurant is great for breakfast, lunch, and dinner, and breakfast is available all day every day. Great Southern-inspired breakfasts like chicken and waffles and biscuits and gravy are followed by lunch and dinner favorites like burgers and fried chicken, and they have a great selection of homemade soups to go with salad combos. Dinners include favorites like fish and chips, and mac-n-cheese made with macaroni noodles, a creamy cheese blend that melts in your mouth, and a crunchy topping, all served with a salad and biscuit. You don’t have to travel to Louisiana to experience authentic Cajun cooking. Just stop by Bayou on Bay in Bellingham, Washington. You’ll get jazzed by all the choices like the oyster or catfish po’boy, prawn étouffée, jambalaya, and shrimp & grits. They even have two distinct choices of macaroni and cheese. There’s a traditional version made with cheddar, gouda, and parmesan cheeses, macaroni noodles, and breadcrumbs to which you can add bacon or andouille sausage, and there’s a pesto mac made with a house-made creamy pesto sauce, mushrooms, shallots, macaroni noodles, and shaved parmesan on the top. Beecher’s is a local icon in downtown Seattle near Pike Place Market, offering artisan cheeses that you can watch made right in front of you. With a love of all cheese, owner Kurt Beecher Dammeier has elevated the art of cheese making to a new level. Using only local sources for premium milk and ingredients, Beecher’s has grown into a nationally loved source in several states besides Washington, like New York and Wisconsin. You can stop by and enjoy a bowl of their “World’s Best” mac & cheese while you watch them make cheese. Made of their special Flagship and Just Jack cheeses, there’s a little spice on the penne pasta that gives it a nice kick. But don’t worry if you don’t live in the area, you can order a Cheese Kit online that includes the recipe! Locally owned and operated Manito Tap House in Spokane, Washington, is an eco-friendly gastropub that serves ordinary food in an extraordinary way. Everything they make is made from scratch with fresh ingredients and they take everything they serve seriously. The first four-star Certified Green Restaurant in town, nothing is done halfway. With over 50 beers on tap and a full menu that includes items like East Meets West Meatloaf and Peanut Butter Jalapeno Crunch Burgers, you can get familiar favorites with a twist like pimento mac & cheese, a delicious variation to traditional mac and cheese that includes pancetta, chipotle, a crispy parmesan bottom crust, and a sunny side up egg on top. 🎉New Link in Bio🎉 Our Gourmet Food Tour was recently reviewed by travel blogger @we3travel! Read about her experience, and then dream about this Smoked Salmon Mac & Cheese from @vons1000spirits. . . .